I’ll answer many Christmas in France related questions: truth and myths about the French Xmas meal, on what day do the French celebrate Xmas + Xmas videos, French Christmas Carols and more! If you visit France around Christmas, you will know it’s Xmas time :-) Although the French don’t necessarily decorate the outside of their houses with des guirlandes éléctriques (string lights), French towns usually do. So Xmas is definitely in the air, a little bit less than it is in the US though: stores don’t necessarily play Christmas songs, and wishing people Joyeux Noël (Merry Christmas) is only done the week of Christmas in France… So not too much in advance. Many towns will also have un marché de Noël – A Christmas market in France: small wooden châlet like stands selling local arts and crafts, special Christmas food such as le pain d’épice (gingerbread), regional delicacies, handmade clothing, des décorations de Noël (ornaments)… Lots of things. Even if they tend to be expensive, it’s really fun to roam the market and gaze at everything. You may even find a special gift or two! 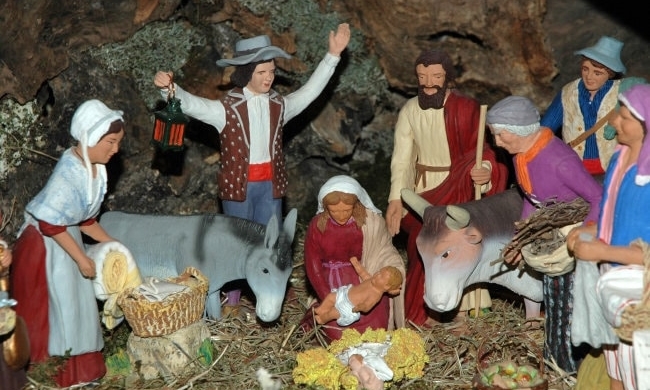 And now, let me try to guess all the questions you may have about Christmas in France. Should you have more, don’t hesitate to ask me in the comment section below. 1 – How Do You Say Christmas in French? We usually use it without an article, just like Christmas (and not the Christmas) in English. However, Noël is a masculine noun, which shows in the adjective: joyeux Noël – merry Christmas. This may come as a surprise. Noël is also a popular first name (although a bit old-fashioned right now – I have an uncle named Noël). Noël is for a boy, it’s spelled Noëlle (or Noelle) for a girl and they are both pronounced the same way. 3 – When Do the French Celebrate Christmas? Christmas Day or Christmas Eve? The Christmas meal in France is called “le réveillon de Noël” and usually takes place on December 24th. But, things change and now, many French families have their traditional Christmas meal on December 25th. More about the true date of Christmas in France in my article. 4 – What is L’Avent? L’Avent (pronounced exactly like “avant” (meaning before – not the t silent for both) is a religious tradition which dictates that starting four Sundays before the coming of Christ, Christians prepare mentally for His arrival. This period is symbolized by a big wreath with a candle une couronne avec une bougie, and a special calendar called le calendrier de l’Avent with a little nook for each day which hides a little treat: an image, toy or candy. You’re supposed to open one slot every day: this helps kids countdown till Christmas and teaches patience. Each year, the exact beginning date of the Advent changes since it starts on the 4th Sunday before the 25th. Well, in theory. In practice, most French Christmas Advent calendars start on December 1st (and end on the 25th). 5 – When Do the French Set Up Their Christmas Tree? If you want to follow the Catholic tradition, le sapin de Noël (the Xmas tree) tree shouldn’t be set up before Christmas Eve, so on December 24th. It should be taken down twelve nights after, for the Epiphanie (the visit of the Kings). Traditionally, we don’t hang stockings on the fireplace around Christmas time in France. However, it’s not a very respected tradition. Nowadays, the numerous Christmas gifts are usually placed under the Christmas tree, or next to it. And you may even see a few stockings hanging down the mantel (if you are lucky to have a fireplace that is!). Although we do have many Christmas songs (watch a video of young Leyla singing “Petit Papa Noël”), caroling in the streets is just not a French tradition. La crèche (the manger) is quite popular in France. Its figurines are often made of clay, with special “santons” (manger figurines made in Provence, very life-like and depicting the nativity as it would happen in a traditional provençal village, with many people such as the baker, villagers etc…) which are often passed down inside the family. Traditionally, the youngest child would add baby Jesus on Christmas day. Our daughter Leyla and I had a fun project: we decided to build our own Manger using Filo dough. We had so much fun! In Northern-Eastern France, Santa is often replaced by Saint Nicholas, and the gifts brought out to children on December 6th. Learn about the French Santa and practice your French with my bilingual article. For the Holidays, Olivier and I recorded a realistic dialogue to introduce you to both the French traditions and precise vocabulary used in France around Christmas and the Holidays. Click on the link to practice your French and learn the French Christmas vocabulary in context! This article comes with audio, French transcript and an English translation. Share it if you like it! Christmas in France is quite different from Christmas in Australia, as described in this article written entirely in easy French by my student Robyn! 14. And now, let Leyla, Olivier and I wish you Happy Holidays in this video. 15 – What About Christmas Greetings in French? To say to someone “Merry Christmas”, we say “joyeux Noël”. The French don’t wish “joyeux Noël” to each other weeks in advance like it is done in the US. We only say it a few days before Christmas. French people do send out Christmas greetings and wishes for the new year, but it’s a tradition which is fading away. The thing which is popular right now is to send out an end of the year recap, often on social networks such as Facebook – by the way, do you know the French facebook vocabulary? Noël – Christmas. Note we usually don’t use any article with the word “Noël”. But it’s a masculine word. For your convenience, I’ve listed in one single article all the French Christmas vocabulary and Expressions. I wrote an entire article sorting out the myths and realities of the typical French Christmas meal. 18. Don’t eat the Smoked Salmon Before the Foie-Gras! If, like most French, you serve both smoked salmon and foie-gras for your Christmas meal, then make sure you start with the foie-gras otherwise, the subtle flavor might get shadowed by the smoked salmon aftertaste. Now with Amazon.fr and many other websites delivering all over the world, it’s not difficult finding a French / France related gift for your Francophile friends. For something more original, I would go for a French Christmas tree ornament, or maybe some magnetic French poetry words. Of course, there is always French food-related products: a recipe book, a cheese cutting board or cheese plates (a bit heavy), French mustards, French wines and Champagne (this is always sure to please me !!)! 20 – What About the New Year in France? In French, we call New Year’s Eve “La Saint-Sylvestre” (pronounced “la sin(nasal) seal vay str”) or “Le Réveillon du Nouvel An”. Celebrated during the night of December 31st, we usually party with friends and/or family, in a more or less formal way. I invite you to read my articles about how the French celebrate New Year in France, and also how to make New Year resolutions in French! 21 – Wait! It’s not Quite Over Yet!! On January 6th, the French commemorate the visit of the 3 kings with a special cake: la galette des Rois. There is a whole tradition about it: you need to know about it if you don’t want to lose a tooth!! You’ll find exclusive mini-lessons, tips, pictures and more every day on French Today’s Facebook, Twitter and Pinterest pages – so join me there!